Technology integration is not a binary choice: you either do it or you don’t. Anyone who has taught, observed classrooms and thought about what it means to include electronic devices and software into daily lessons knows that technology integration, like raising a child, learning to drive or cultivating a garden, is a process–not an either/or outcome. One goes through various stages in learning how to raise a child, drive a car, grow a garden. In each instance, a “good” child, driving well, a fruitful garden is the desired but not predictable outcome. A host of researchers and enthusiasts have written extensively about the different phases a teacher, school, and district goes through in integrating technology into their daily operations. Most of the literature seldom mentions that such movement through increasingly complicated stages is really phases of putting a new idea or practice into action. The labels for the levels of classroom practice vary–novice to expert, traditional to innovative, entry-level to transformational. Writers and professional associations have described how individuals and organization stumble or glide from one phase to another before smoothly using electronic devices to reach larger ends. And it is the ends (e.g., content, skills, attitudes) that have to be kept in sight for those who want teachers to arrive at the top (or last) stage. Buried in that final implementation stage is a view of “good” technology integration and, implicitly, “good” teaching. Often obscured but still there, these notions of what are “good” teaching and learning are embedded in that last stage. Figuring out those ends and what values are concealed within them is difficult but revealing in the biases that model-builders and users have. As with arriving at a definition (see last post), I have examined many such conceptual frameworks that lay out a series of steps going from a beginner to an expert (across frameworks the names for each step vary). Most often mentioned are the Apple Classroom of Tomorrow (ACOT) and the SAMR models. Many implementation frameworks in use are variations of these two. One of the longer initiatives ever undertaken in creating technology-rich classrooms—ACOT lasted nearly a decade—researchers drew from observations and interviews with teachers and students a host of findings one of which was the process that teachers went through in integrating technology into daily lessons. That five-stage process that ACOT teachers traversed went from Entry where teachers coped with classroom discipline problems, managed software, technical breakdowns and physical re-arrangement of rooms to Adoption where beginners’ issues were resolved. The next stage of implementing technology in the classroom, Adaptation, occurred when teachers figured out ways to use the devices and software to their advantage in teaching—finding new ways of monitoring student work, grading tests, creating new materials, and tailoring content and skills to individual students. At this stage, teachers had fully integrated the technology into traditional classroom practice. Developed by Ruben Puentedura, SAMR stands for: Subsitution, Augmentation, Modification, Redefinition. The four rungs of the implementation ladder go from the lowest, replacing an existing tool (e.g., overhead projector) with an electronic device (e.g., interactive whiteboard) but displaying no change in the pedagogy or lesson content to the next rung where the lesson is modified through use of new technology (e.g., study the concept of the speed of light by using a computer simulation). 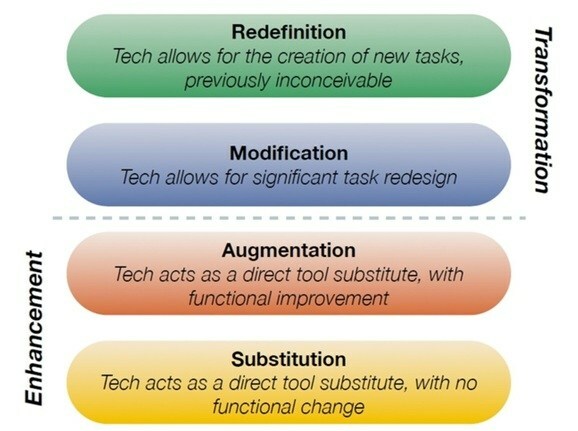 The third rung of the ladder of putting technology into practice is where the teacher modifies the lesson and “allows for significant task redesign” (e.g., students show their understanding of content in class by recording audio and then saving it as a sound file) and, finally, to the top of the ladder, redefinition, where the technology “allows for the creation of new tasks previously inconceivable.” Examples here would be students creating a movie or podcast and putting it on the Internet to get comments or students writing posts for a class blog on the web about the history of the Great Depression. At this final stage of technology integration, student engagement is highest. The SAMR model assumes that high student engagement leads to gains in student academic achievement. Thus, the SAMR model implicitly promises improved student achievement. Both ACOT and SAMR involve what teachers know of subject-matter content, insights into their own teaching, and what they know about using technology. 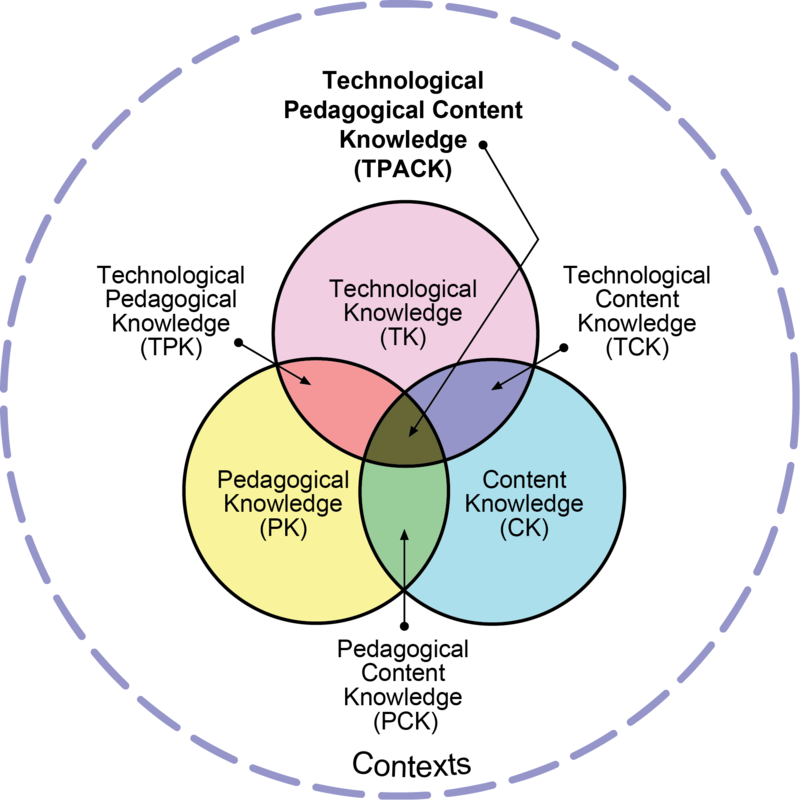 This interplay between content, pedagogy, and technology has led to another popular model among technology coordinators, practitioners, and researchers in the field. Too often, however, the top rung of the ladder—where putting technology integration into creating active learning tasks for students–becomes a proxy for success. 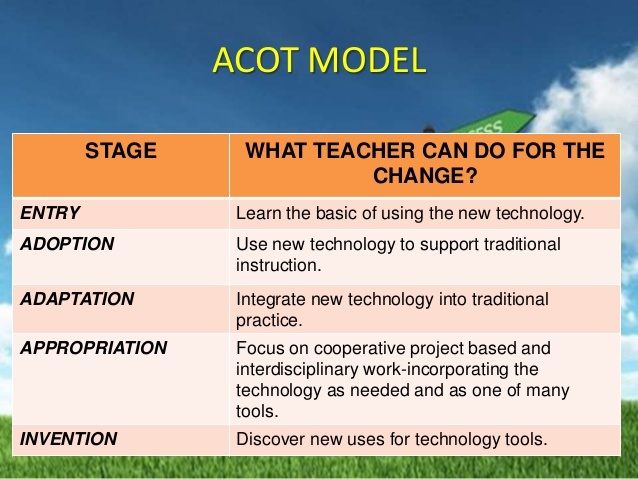 Either “Invention” in the ACOT model or “Redefinition” in SAMR becomes surrogates for judging teacher success in not only effectively integrating their use of technology but also in improving student outcomes. And that is unfortunate. [i] Judith Sandholtz, Cathy Ringstaff, and David Dwyer, Teaching with Technology : Creating Student-Centered Classrooms (New York: Teachers College Press, 1997). See p. 187 for number of ACOT teachers, schools, and states. I did a Google search for “SAMR model” and got 245,000 hits; “ACOT model” received just over 63,000 entries. September 4, 2016. A Google search for “TPACK model” on September 4, 2016 produced just under 90, 000 hits. [vi] The summary of ACOT research and practice is in: Judith Sandholtz, Cathy Ringstaff, and David Dwyer, Teaching with Technology : Creating Student-Centered Classrooms (New York: Teachers College Press, 1997). The sub-title captures the intent of the model. The SAMR model highlights increasing student engagement at each rung of the ladder. Among advocates of student-centered classrooms, engagement is a synonym for “active learning,” a principle undergirding student-centeredness in teaching. While increasing active student involvement at each stage beyond Substitution, Ruben Puentadura has not stated directly his preference for student-centeredness as a goal. I have found no direct statements on his seeking student-centered instruction. Those curriculum specialists, teachers, technology coordinators and independent consultants who have picked up and ran with SAMR, however, have indeed seen the model as a strategy for teachers to alter their classroom practices—with qualifications and amendments–and embrace student-centered instruction. It never ceases to amaze me that SAMR gets so much exposure, despite the RAT (or TAR if you prefer) framework developed by Hughes et al, precedes it by at least two years. If you haven’t encountered it here’s a link to a post I’ve written that attempts to rid the world of its ignorance!